2001-2002: 11 MiG-29 9-12B + 1 MiG-29UB 9-51 from Russia. Contract signed in 2001*. 2011-2012: 10 MiG-29 9-12B + 6 MiG-29SE + 4 MiG-29UB from Russia. Contract signed in December 2009 for 10 x MiG-29, 4 x MiG-29UB, 6 x MiG-29SE. * Regarding a gap between numbers (see below), is possible that in first batch were more than 12 aircraft? Since 2010 MiGs were overhauled in Ukraine, in Lviv State Air Repair Plant. MiG-29, Myanmar 2007. 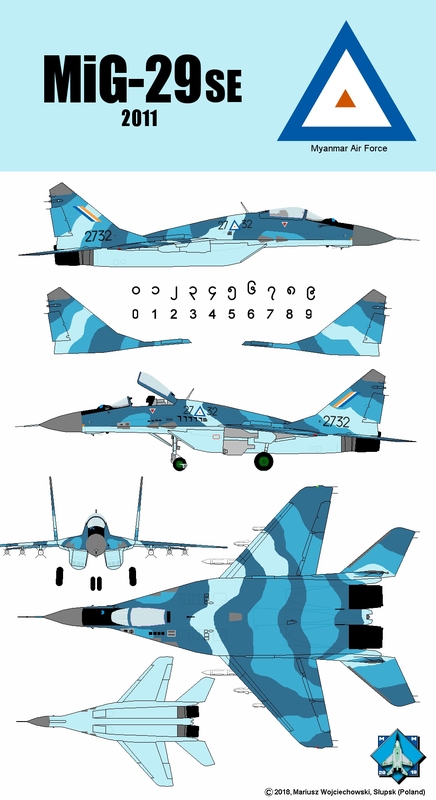 All MiGs have similar camouflage. Drawing from 2010 is compilation of some aircraft. MiG-29SE, Myanmar 2013. After overhaul in Ukraine. 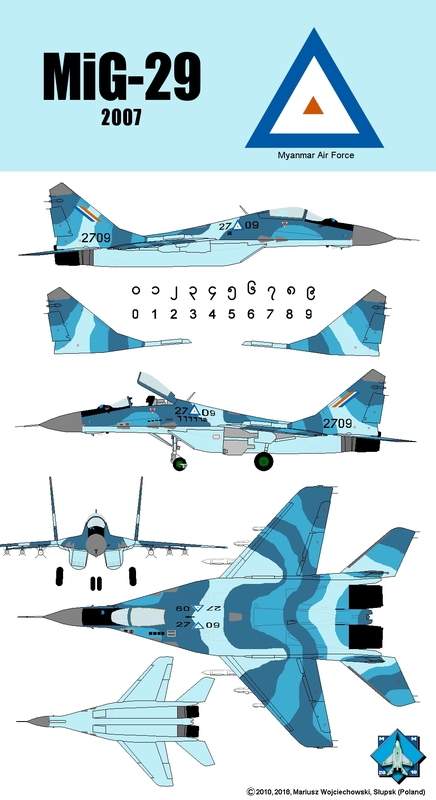 All MiG-29SE have similar camouflage, slightly different than older one. Drawing from 2018 is compilation of some aircraft.